So winter is coming to an end and Spring is fast approaching and with it it bring lots of cute baby animals, Easter eggs and sunny weather. Lush have really got into the spirit of things this Easter and produced a huge variety of products for their Easter range. The Spring Bunny bath bomb is a new release product this year and is available as part of gift sets in store or individually at the flagship Oxford street store. This bath bomb is ever so cute and is the perfect design for an Easter range. 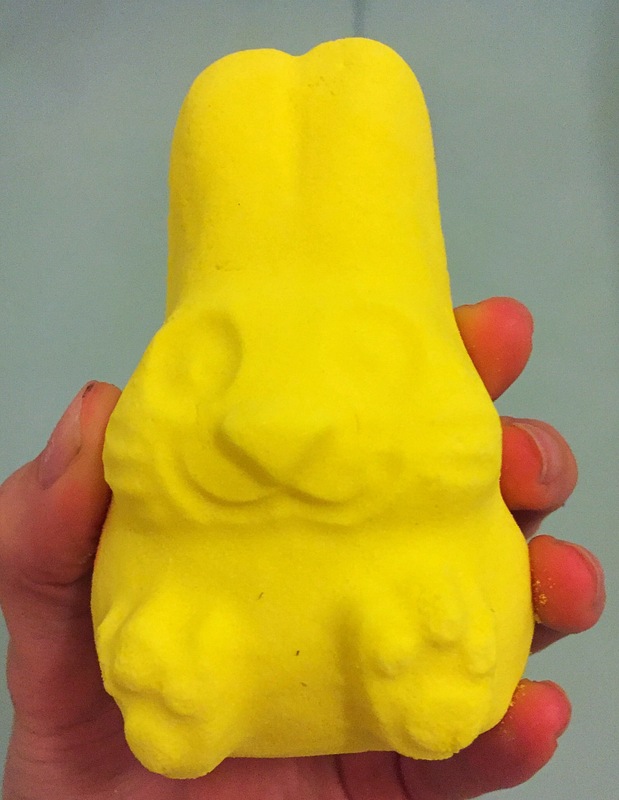 Shaped like a little bunny this lemon yellow bath bomb can’t help but make you smile. Im defiantly going to be buying people these rather than Easter eggs this year. 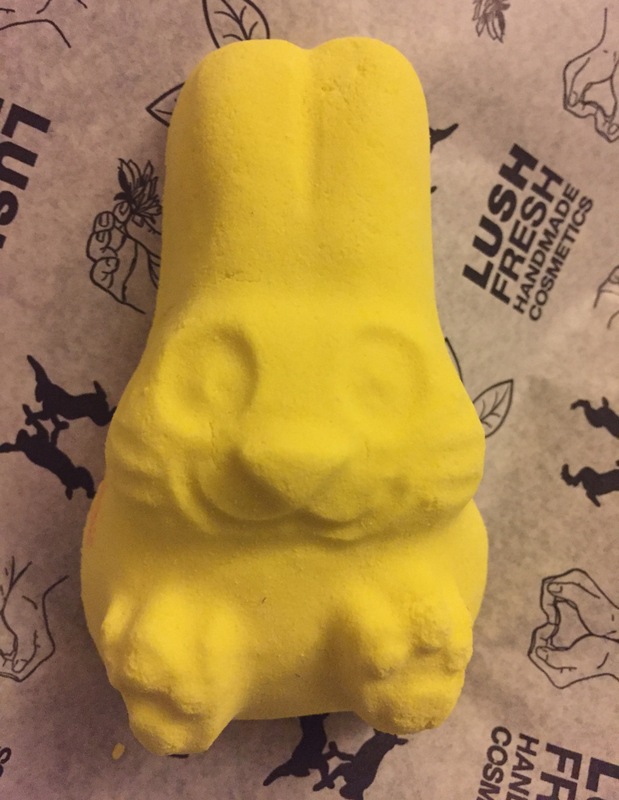 This little bunny isn’t the largest of bath bombs I have seen but it smaller size and cute design will defiantly make it a hit for children as well as adults. I fell in love with this product at first sniff. With its main ingredient being Sicilian lemon oil, this little bath bomb has an exstremly citrusy scent. Seeing as this bath bomb is quite small in size, I was really impressed with how strong it’s scent is. The scent is a very strong lemon scent but a more sweet rather than sharp lemon scent. The scent reminds me very much of lemon sherbets and lemon Bon bon sweets. Once popped in the water the Spring bunny slowly starts to fizz away, it actually took an awful lot longer to dissolve than I was exspeting. As it fizzed it produced a lovely yellow froth over the surface of the water. 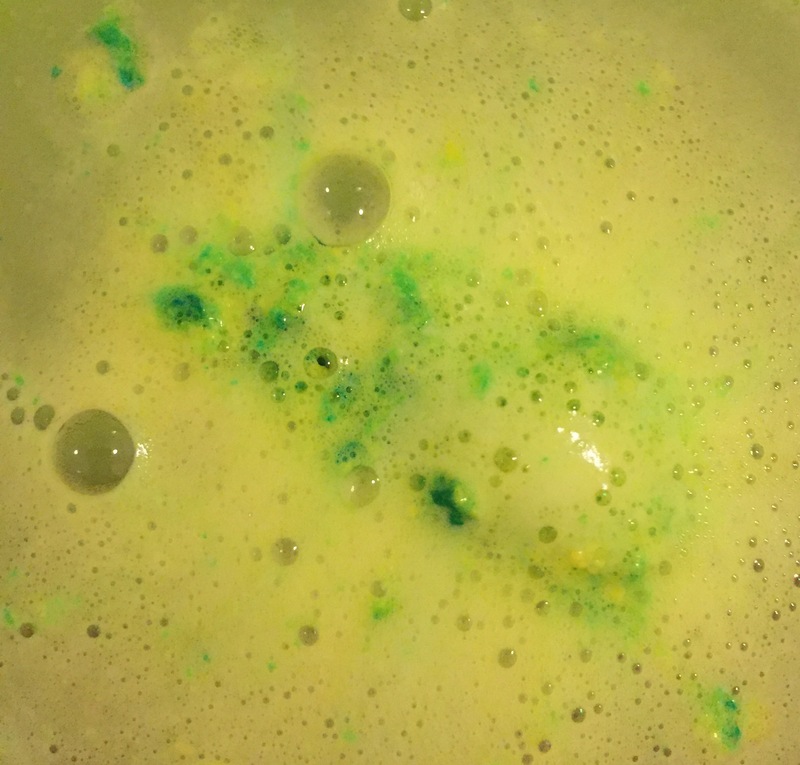 Once this bath bomb reached its centre, it sent out streaks of blue with made beautiful swirls amongst the yellow froth. This bath bomb is actually very moisturising as it contains an ample amount of cocoa butter, which I wasn’t expecting from this product. 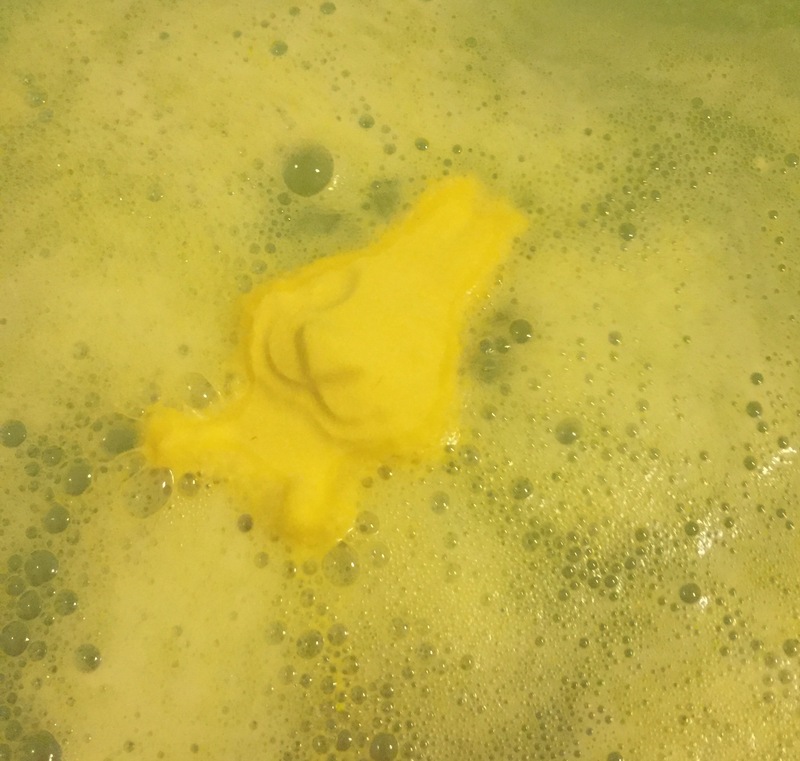 Although unlike the butterball bath bomb and other moisturising products, it didn’t leave little droplets of oil on the surface of the water. I was also very glad to find that the scent didn’t fade away once the bath bomb was fully dissolved and that the scent created a very uplifting aroma perfect to brighten up the last of the cold winter days. Overall I couldn’t have been happier with this product. It has a great cute design, has an incredible aroma that is beautifully uplifting and created one of the most moisturising bath I have ever had without leaving me feeling all slimey. I’m keeping my fingers crossed that I can get down to Oxford street and buy a few more of these little bunnys before they all vanish. Ingredients – Sodium Bicarbonate, Citric Acid, Fair Trade Organic Cocoa Butter, Sicilian Lemon Oil, Limonene, Laureth 4, Carrot Oil, Water, Citral, Colour 47005, Colour 42090.
hi I just started following your blog and I love it ❤ I recently started a new blog and would love if you (or anyone reading this) could please check it out and maybe give a few likes and comments ?